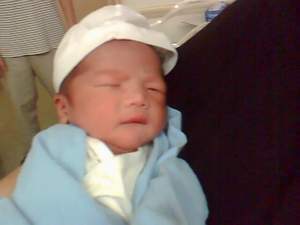 My only brother (M0rN1nG) and his wife (N!cE) are proud parents to a baby boy they named André Miguel and this is his first official photo. How adorable and gorgeous! They refused exclusive coverages of A.M.’s first baby pictures from either CNN or BBC but agreed to pose for our Blogger accounts. ah what a cutie. I love babies. Congratulations! It´s a wonderful boy. I still think that the “Who’s Your Daddy” baby thing you sent for AM is so kewl, they ought to take photos and show it to us soon!